KT Tape is a revolutionary sports medicine solution for treating and preventing common sports injuries such as ITBS, shin splints, plantar fasciitis, knee pain and more. Ultra-light, elastic, and strong, KT Tape is highly effective at providing pain relief, stability, support and faster recovery for injured or sore muscles and joints - without sacrificing comfort or freedom of movement. KT Tape is simple to use and easy to apply. 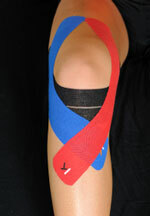 Most common injury applications require only two strips of tape. Each box of tape comes with step-by-step instructions. Click Here for Injury-specific video instructions. KT Tape is simple to use and easy to apply. Most common injury applications require only two strips of tape. Each box of tape comes with step-by-step instructions. Injury-specific video instructions (1-2 minutes long) for common applications are also available on the KT Tape U.S. Website.